We’re in Denver, relaxing after a fun flight over. I can’t believe I’m typing that – having a fun flight, but it’s true. My husband and I have flown with different carriers over the years and the experience has been underwhelming for the most part. Besides seeing the flight prices go up (counting all the fees tacked on), I’ve noticed the quality of service has gone down. the airport is a hassle, the food and drinks are skimpy, and on some flights the attendants are grumpy. All in all not a fun or relaxing way to travel. This week we’re attending FinCon and so we took a flight in to Denver today with Southwest. It was our first time and it was great. We chose to fly with Southwest for the trip basically because they had a direct flight and their prices were very reasonable. When you’re flying as a family money is an issue so I was really happy to see that their direct flight prices were around the same price as flights from other airlines with layovers. With a little one traveling with us direct flights were our goal and the price point that southwest. Managing a 3 1/2 hour flight is much easier than a 6-7 hour trip with a stop included. Included with the competitive prices are the lack of fees tacked on to your ticket. I love Southwest’s checked baggage policies. When you fly with them you get up to 2 bags at no additional charge. That’s not counting your carry-ons. I understand that to save money airlines have cut back on the food they offer on their flights. I’m used to the bare minimum approach. Southwest was fancy, but they weren’t skimpy.We were offered plenty of snacks and drinks through out the flight. I also happily surprised at the alcoholic beverages offered on the flight. (I drank for review purposes only 🙂 ) For only $4 I had a really good Jack and Coke on my flight. I wish other airlines were a bit less stingy with sharing their drinks and snacks. During the flight I had coffee, juice, Jack and coke, water, peanuts, and chocolate chip cookies. It was great. I just want to mention the friendly service we received with all of Southwest’s staff and crew. The airport was a bit hectic and customers were asking questions as the staff was serving others with their baggage and ticket needs. All of the crew were polite and cheerful and kindly let the customers know they would be helped soon. The flight crew was equally happy and they seemed genuinely concerned with providing a great flight for all of us. Good job Southwest! The only thing that I’ve noticed with Southwest is that they are not all across the country just yet. 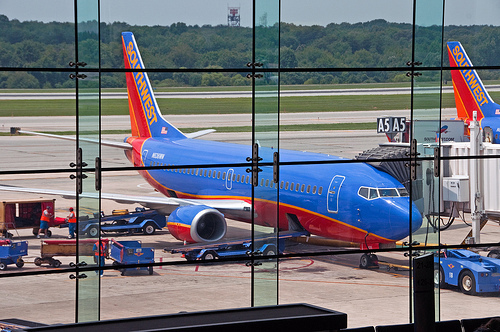 They are growing so I hope that if your airport doesn’t offer Southwest it will soon. I’d love to hear from you about your travel experiences. 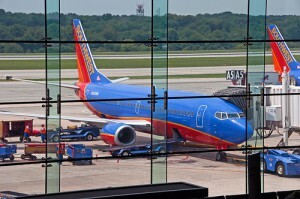 How many of you have flown Southwest? Did you enjoy your flight(s)?